A new book has revived suggestions that Merkel was an active trade union official – at a time when the state controlled the unions. GERMAN CHANCELLOR Angela Merkel has shrugged aside a new book that suggests she may have been closer to East Germany’s communist system than previously thought, saying she’s never hidden anything. 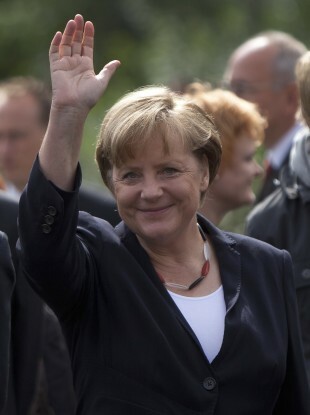 58-year-old Merkel grew up in the then-East Germany, and entered politics just as communism crumbled in 1989. A book being published this week revives questions about whether Merkel was a propaganda secretary for the youth organisation, which she has denied. The book also says she was an active labour union official. At that time, there were only state-approved unions in East Germany. “What is important to me is that I have never hidden anything,” Merkel said at the weekend, after attending the screening of an old East German film in Berlin. “I can only rely on my memory,” she said. If other things emerge, “one can live with that too,” she said. “Perhaps I have not talked about other things because no one has ever asked me about them,” Merkel said. She cited her membership of East Germany’s union organisation as an example, news agency DPA reported. Merkel — the daughter of a Protestant pastor who moved his family from West Germany to the East in the 1950s — has said that she joined the Free German Youth, the communist youth organisation, largely for social reasons. The latest in a long line of books about Merkel is titled ‘The First Life of Angela M’. It was written by two German journalists, Guenther Lachmann and Ralf Georg Reuth. So far, it has generated no real political controversy, although it comes as the popular chancellor prepares to seek a third term in September elections. Email “Angela Merkel: ‘No, I was not an East German propaganda official’”. Feedback on “Angela Merkel: ‘No, I was not an East German propaganda official’”.